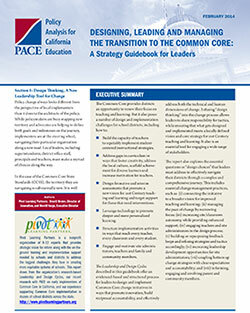 The adoption and implementation of the Common Core State Standards and Smarter Balanced assessments in mathematics are intended to provide all students in California with the knowledge and skills required to transition from high school to college-level coursework. This implementation will take time. California has embarked on a major new wave of curriculum reform with the adoption of the Common Core State Standards (CCSS), the new English Language Development (ELD) standards, and the Next Generation Science Standards (NGSS). 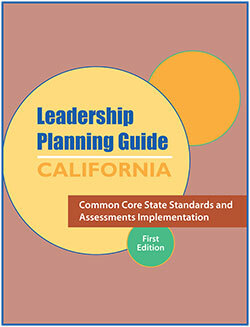 The adoption of the CCSS builds a legacy of standards-based education reform in California that began with the development of curriculum frameworks in the 1980s and continued with the adoption of the California State Standards and the approval of the Public School Accountability Act. 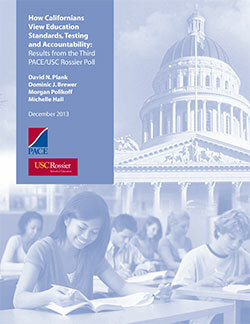 California is in the midst of sweeping education changes. 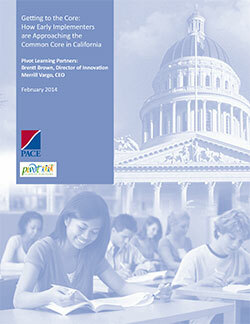 The state is rolling out the Common Core State Standards (CCSS) and a new system of assessments. Voters approved a temporary statewide tax increase that will provide additional funding to schools after years of spending cuts. The Legislature adopted a new system for funding schools (the Local Control Funding Formula, or LCFF) that shifts resources to school districts that enroll lots of poor students and English learners, while granting local districts tremendous control over their budgets and spending. 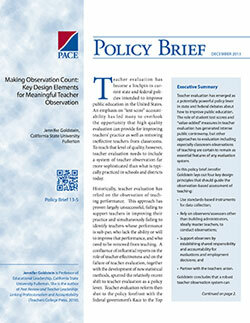 Teacher evaluation has emerged as a potentially powerful policy lever in state and federal debates about how to improve public education. The role of student test scores and “value-added” measures in teacher evaluation has generated intense public controversy, but other approaches to evaluation including especially classroom observations of teaching are certain to remain as essential features of any evaluation system. 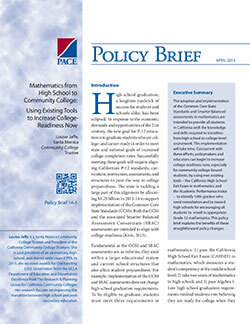 California has a unique opportunity to improve public education by strengthening instruction, providing targeted support for English learners and struggling learners, preparing students for the demands of the technology reliant 21st century, and expanding pathways for students to college and career. This opportunity is made possible by the adoption of the Common Core State Standards (CCSS) which are designed to increase expectations to the level of other highperforming countries, go deeper into subjects, are based on research, and provide for a more active curriculum. 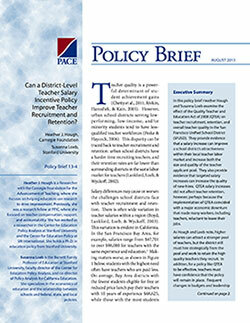 In this policy brief Heather Hough and Susanna Loeb examine the effect of the Quality Teacher and Education Act of 2008 (QTEA) on teacher recruitment, retention, and overall teacher quality in the San Francisco Unified School District (SFUSD). They provide evidence that a salary increase can improve a school district’s attractiveness within their local teacher labor market and increase both the size and quality of the teacher applicant pool. They also provide evidence that targeted salary increases can increase the quality of new-hires. Internet-related technology has the capacity to change the learning production system in three important ways. First, it creates the capacity to move from the existing batch processing system of teaching and learning to a much more individualized learning system capable of matching instructional style and pace to a student’s needs. 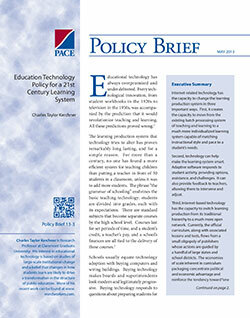 Second, technology can help make the learning system smart. Adaptive software responds to student activity, providing options, assistance, and challenges. It can also provide feedback to teachers, allowing them to intervene and adjust. The full policy implications of the Common Core State Standards (CCSS) for Mathematics and English Language Arts K-12 are just beginning to unfold across the 45 states (and DC) that are working to implement them. 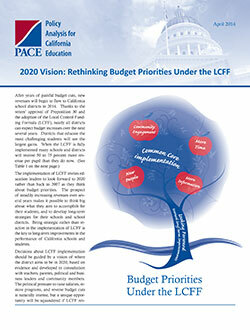 The CCSS will impact almost all key state education policies in fundamental ways. As we learned from the 1990-2005 era of systemic state standards-based reform, when academic standards change, so do policies related to student assessment and school accountability.